OXFORD, Miss. – Three University of Mississippi engineering professors are collaborating with colleagues at Jackson State University and NASA’s Jet Propulsion Laboratory to improve communications with deep-space probes and, perhaps even, manned missions. 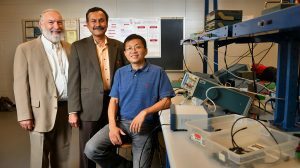 Lei Cao, Ramanarayanan Viswanathan and John Daigle, all professors of electrical engineering, are working with researchers at Jackson State University and the Jet Propulsion Laboratory on a project funded by NASA’s Experimental Program to Stimulate Competitive Research, or EPSCoR. The project, “A New Paradigm for Efficient Space Communications: Rateless Coding with Unequal Error Control and Data Fusion,” has achieved good results in theory and simulations. The team has proposed a new protocol for deep-space communications that may both improve the reliability and increase the reception rate of images or data received from spacecraft. The results may provide a basis for improving data transfer rates over wireless systems, such as cellular phones, on Earth. The project also may help enable the co-existence of different wireless communication systems for sharing the same frequency spectrum. The primary challenge in deep-space communications is that as spacecraft travel farther from Earth, the vast distances cause substantial round-trip delays in the signal and high bit error rates in wireless communications. Also, the long distances cause large attenuation (loss in the signal’s strength along the path), various noise and distortion due to the Earth’s atmosphere and the sun’s corona. Solving these difficult problems is critical because the need for higher data-rate communications for various exploration missions continues to grow, said Viswanathan, who also is chair of the UM Department of Electrical Engineering. “Through this cooperative agreement, the research team at UM has made significant contributions to improve both the quantity and quality of information obtained through deep-space exploration,” he said. Data in communications are in the form of binary bit sequences. One bit sequence is often segmented into a number of packets, or basic data units. For example, a few thousand bits could be grouped into one packet. Bits in the packet can be coded together to increase their resilience to signal distortion. To deal with the effects of long round-trip time, instead of transmitting the original data packets, the researchers encode the packets into a large number of new packets for transmission. At the receiver, the original packets are recovered by using sophisticated algorithms to decode a number of new packets. Together with this new protocol, a number of advancements, including effective coding and decoding algorithms, dynamic selection of the code rate of error control codes and channel prediction algorithms, have been made so that substantial improvements in data transmission over space-to-earth channels can be achieved. In addition, efficient methods of fusing data to improve the quality of information derived from the collected data have also been developed. New strategies have been proposed to determine what kind of information should be sent to the fusion center from different observers and what optimal fusion rule should be used to maximize the detection probability while minimizing the false-alarm probability. “The theoretic advancements and practical implementation methods made through this project have been documented in more than 20 peer-referred publications and invited talks and conference presentations,” Viswanathan said. Besides the technical achievement, a research team, which includes three professors and several graduate students in the Department of Electrical Engineering, has been formed to focus on areas of fountain codes, signal detection and wireless communications. This team, working with other faculty within School of Engineering, has been pursuing collaboration and research opportunities with other agencies and companies. One prominent success is the establishment of the UM site of the Broadband Wireless Access and Applications Center in 2016. BWAC is a multi-university National Science Foundation Industry/University Cooperative Research Center, led by the University of Arizona in partnership with UM, Virginia Tech, University of Notre Dame and Catholic University of America. With NSF support, the center works to advance wireless technologies and provide cost-effective and practical solutions for next-generation – 5G and beyond – wireless systems, millimeter-wave communications, wireless cybersecurity, shared-spectrum access systems, full-duplex transmissions, massive multiple input, multiple output techniques, and more. “The mission of BWAC is to collaborate with industry research partners to create flexible, efficient and secure wireless networks that satisfy broadband communication needs in businesses, in the home and in the lives of individuals,” Daigle said. Some of the work directly links to the technologies and expertise developed through this NASA project. For example, they have built a small network that can perform the same basic functions as a commercial Global System for Mobile network, including voice, Short Message Service, Multimedia Messaging Service and General Packet Radio Service. The students presented their work at the 31st National Conference on Undergraduate Research and published a paper in the UM Undergraduate Research Journal.